Does gay marriage support the right-wing goal of linking access to basic human rights like health care and economic security to an inherently conservative tradition? Will the ability of queers to fight in wars of imperialism help liberate and empower LGBT people around the world? Does hate-crime legislation affirm and strengthen historically anti-queer institutions like the police and prisons rather than dismantling them? The Against Equality collective asks some hard questions. These queer thinkers, writers, and artists are committed to undermining a stunted conception of "equality." 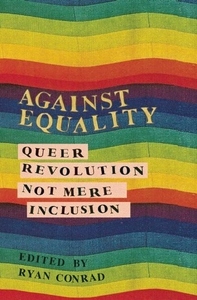 In this powerful book, they challenge mainstream gay and lesbian struggles for inclusion in elitist and inhumane institutions. 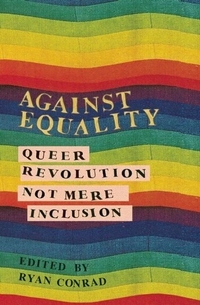 More than a critique, Against Equality seeks to reinvigorate the queer political imagination with fantastic possibility! In Oakland, California on March 24, 2015 a fire destroyed the AK Press warehouse along with several other businesses. Please consider visiting the AK Press website to learn more about the fundraiser to help them and their neighbors.